The lamps can filter housings are mounted so that water can flow without resistance along. NOTE: the scope of the UVC radiation has a certain limit (depending on s.a. the clarity of the water) so that there is only one part of the water that is irradiated by the lamp.The user is responsible the dangers of exposure to UVC radiation to the eyes! use the included UV safety goggles and / or a switch the lamp off automatically when there is access to the lamp. With the aid of a feed-through coupling Ø32mm is the immersion UVC easy to install in filter installations. A hole of Ø43mm sufficient for mounting the transit link (1 ¼ "external thread).The bushing can be a wall thickness of about 42mm bridges. The lamp base is Ø32mm and 32mm pipe clamps can possibly be confirmed when the lamp "loose" in an enclosure is used. Length of immersion UVC (40 & 75 watts) is100cm. The lamp has 9000 hours and a net output of 25.000 microwatt. 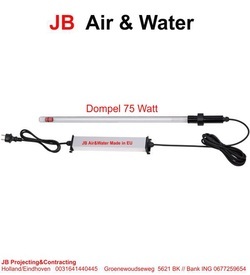 The lamps are with 10 meter cable and connector for the electronic ballast supplied.These submersible UV unit is equipped with a special screw system so that only the bulb can be replaced.